"Children deprived of liberty are among the most forgotten and left behind in society and it is crucial to engage the support of all actors for their increased care and protection. Preventing and responding urgently to this serious and often neglected situation is a legal and human rights imperative; and it is critical for achieving the Sustainable Development Goals" the SRSG added. In her statement at the Forum, SRSG Santos País pointed to the need to prevent the deprivation of liberty of children in the first place and focused on the special risks faced by girls. “The violence committed against girls in the criminal justice system is often invisible. They face criminalization and harsh sentencing on the grounds of “immoral character” or perverse conduct, and there is a lack of alternative non-custodial measures, restorative justice approaches or community-based programmes tailored to girls’ needs and best interests”, the SRSG acknowledged. She also highlighted the negative impact on children whose parents or guardians are deprived of liberty. For these children, fear, insecurity and lack of access to support services are very high concerns. Children are often bullied at school because their relative is in prison and, as they highlight, they feel treated as if they were the delinquent. “Children with a parent deprived of liberty are one of the most invisible groups in public policies. They have a right to safe and respectful spaces for visits between them and their caregivers deprived of liberty; places where they can be heard, recognized and supported to break the traumatic secret that surrounds their life and the silence that shrouds their existence”, said Santos Pais. In this regard, SRSG Santos Pais presented the preliminary findings from research being conducted in Latin America in cooperation with the Uruguayan NGO Gurises Unidos and the regional Platform for children with a parent deprived of liberty. SRSG Santos Pais emphasised the critical contribution of the Global Study on Children Deprived of Liberty to these important concerns. The Study was requested by the UN General Assembly in 2014 and is supported by an Inter-Agency Task Force chaired by the SRSG. 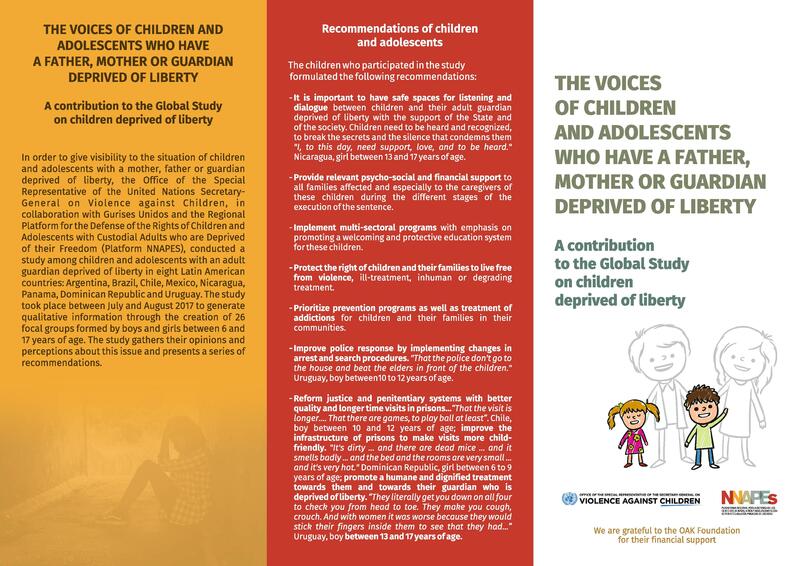 “The Global Study will help prevent deprivation of liberty of children by promoting effective alternatives to custodial measures, by investing in restorative justice processes, and by safeguarding children’s rights at all times, including when children are victims, witnesses, or alleged perpetrators of criminal offences” said Santos Pais. The 11th European Forum on the Rights of the Child brought together more than three hundred experts representing the EU institutions, governmental officials, civil society, international organisations, children’s ombudspersons and academia to discuss EU and international commitments on children deprived of liberty.